Letting my kids catch the bus home from school for the first time on their own was and continues to be SUCH a big deal to me given I am pretty much being a self confessed bonafide helicopter parent. My kids on a bus without me there to protect them… that makes me nervous. Towards the end of last year (and after much begging on their part) I agreed to let them catch the bus home from school. For the first four months or so I waited at the bus stop for them so that when they got off, I could make sure they crossed the road OK and walk the short two blocks home safely. After a while they persuaded me to wait for them across the road from the bus stop, and then up and across the road, and then eventually, nearly a year on, I allowed them to walk all the way home from the bus stop by themselves. Oh believe me, I struggled with letting them do this by themselves. I struggled because I want to be there to protect them. I kind of NEED to be there - at least for my own peace of mind. But the reason we worry is because things can and do happen. Things can go tragically wrong in a mere split second. Did you know that between 2010 and 2014 there were 122 kids aged between 5 and 16 years that were casualties (and fatalities) in bus related incidents, and 96 of those accidents occurred during school travel times (7.30 to 9.30am and 2.30 to 5.00pm)? That is a bloody good reason for any of us to be worried. 26 of those casualties were kids aged 10-12 - the age of one of my own three boys. That’s the age group that generally think they are old enough and responsible enough to make on the spot decisions, but the reality is they simply do not have the maturity of an adult brain to accurately gauge the risks. The fact that there is an increased number of pedestrian accidents during school travel in the 10-14 aged group, compared to the younger kids, is testament to that alone. Our kids will reach a point where they want their independence, and at some stage we really do need to give it to them to some degree… and that is hard to do, I know. But it is part of growing up and all we can do is equip them with as much as we can so that they can protect themselves when we aren't there to do it for them. We need to teach our kids to be safe both in and around buses. We need to talk to them about this and remind them to Stop, look, think and Listen. We need to USE all that energy we put into worrying about our kids to some good use and teach them HOW to keep themselves safe. 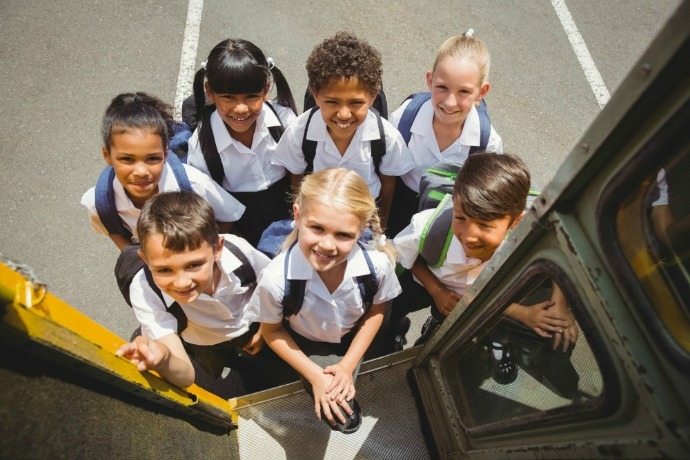 Transport for NSW is working very hard to raise awareness about bus safety for our school age kids in order to reduce and prevent accidents, and they have launched a Be Bus Aware campaign. We parents need to work with them to spread the messaging so that we can ensure our kids arrive home safely to us fro school. The inaugural Bus Safety Week ran from the 1st to the 7th November and it is the perfect time for us to reinforce the safety messages to our kids. STOP, LOOK, LISTEN and THINK. Be aware of the cars and trucks and other buses when you are crossing at your bus stop. Don't just trust that drivers see you, take charge of the situation yourself. Get back from the kerb when you are waiting for the bus or to cross a road. Don't push in line or muck around when you are waiting for or getting on a bus. When you are on the bus - SIT down. Keep your bag on your lap or under the seat and both you and your bag need to stay there until it is time to get off the bus and the bus has come to a complete stop. Do not look at your phone, play with any technology or be distracted by your friends when you are getting off the bus and crossing the road. Focus one hundred percent on crossing safely. Use the pedestrian crossing or the lights to cross the road and walk, don't run. This video below is targeted at kids in primary school and it is designed to get them thinking like a secret bus agent, teaching them how to identify danger and how to stay safe when travelling to and from school. Please, do yourselves and your kids a HUGE favour and get them to watch this 6 minute video. Share it with your friends who have kids and share it on your Facebook page - let’s just get it out there. It is a fun but effective away of getting these safety message though to our kids and will go a log way to helping to prevent any further casualties during school hours. Do your kids catch the bus to or from school? Did you struggle with letting them go like I did / do?